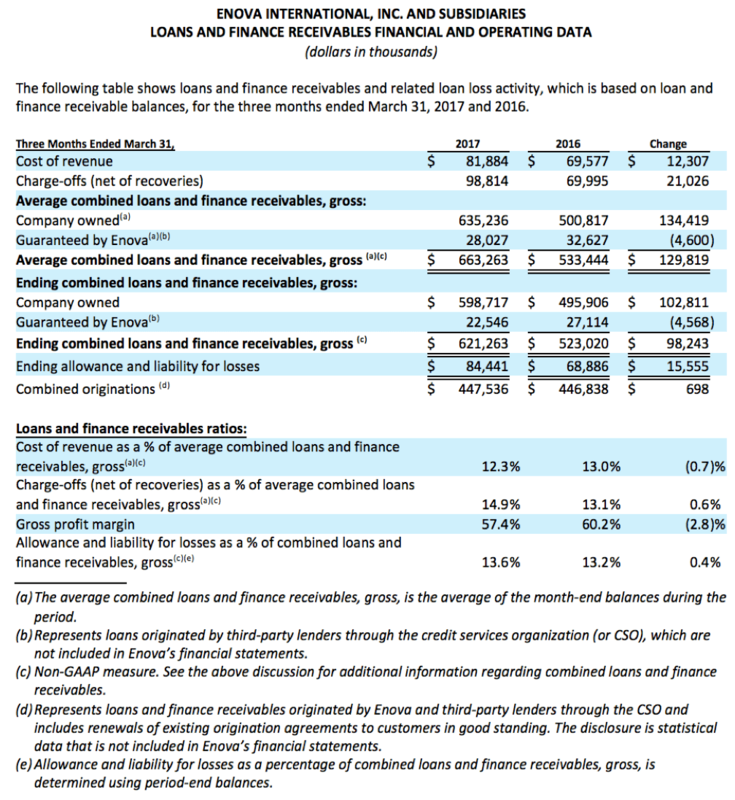 Enova Reports First Quarter 2017 Financial Results - Enova International, Inc.
CHICAGO (April 27, 2017) — Enova International (NYSE: ENVA), a leading financial technology company offering consumer and small business loans and financing, today announced financial results for the quarter ended March 31, 2017. Total revenue of $192.3 million in the first quarter of 2017 increased 10.1% from $174.7 million in the first quarter of 2016. Gross profit margin was 57.4% in the first quarter of 2017 compared to 60.2% in the first quarter of 2016, driven by stronger growth in the U.S. installment loan and receivables purchase agreements and a higher mix of new customers, which requires higher loan loss provisions. Net income of $13.9 million, or $0.41 per diluted share, in the first quarter of 2017 increased from $9.9 million, or $0.30 per diluted share, in the first quarter of 2016. 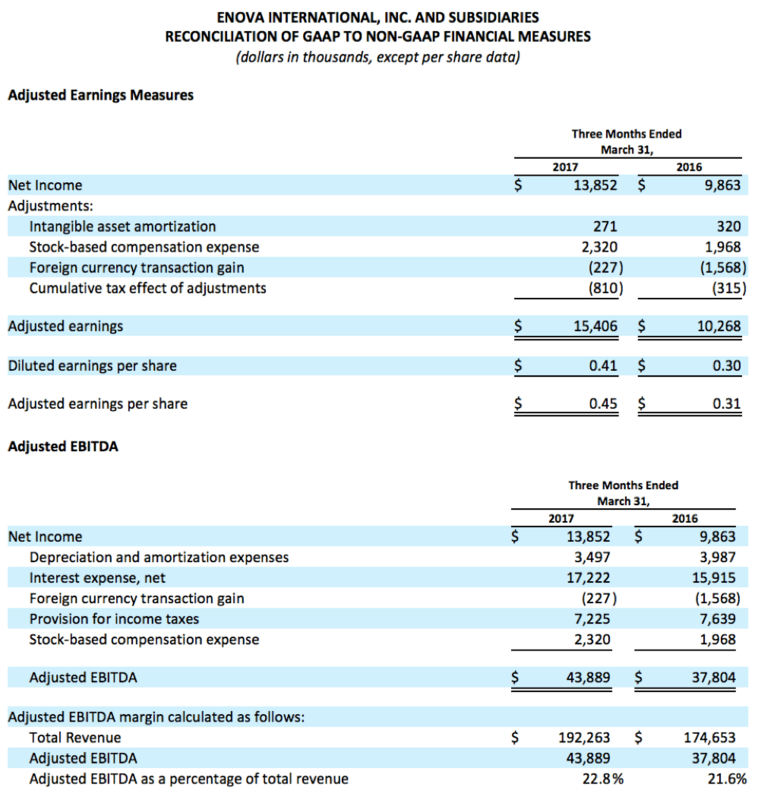 First quarter 2017 adjusted EBITDA of $43.9 million, a non-GAAP measure, increased from $37.8 million in the first quarter of 2016. 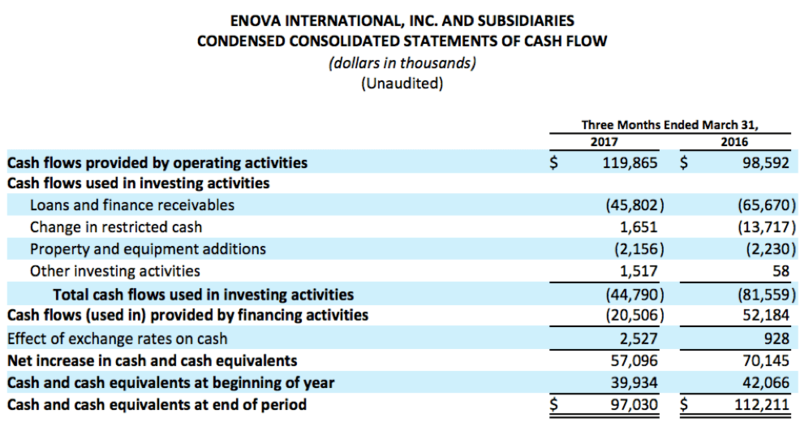 Enova ended the first quarter of 2017 with unrestricted cash and cash equivalents of $97.0 million. 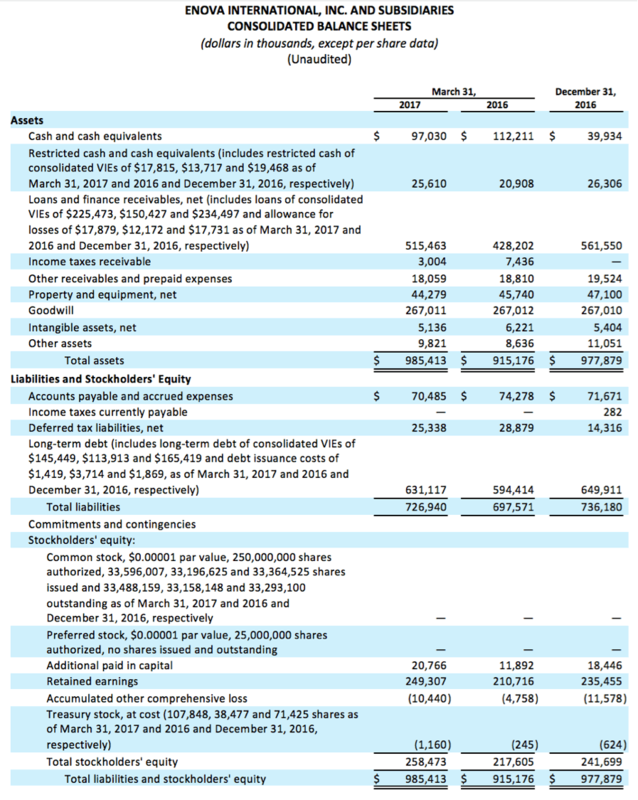 As of March 31, 2017, the company had total debt outstanding of $631.1 million, which included $145.4 million outstanding under Enova’s $295 million securitization facilities. 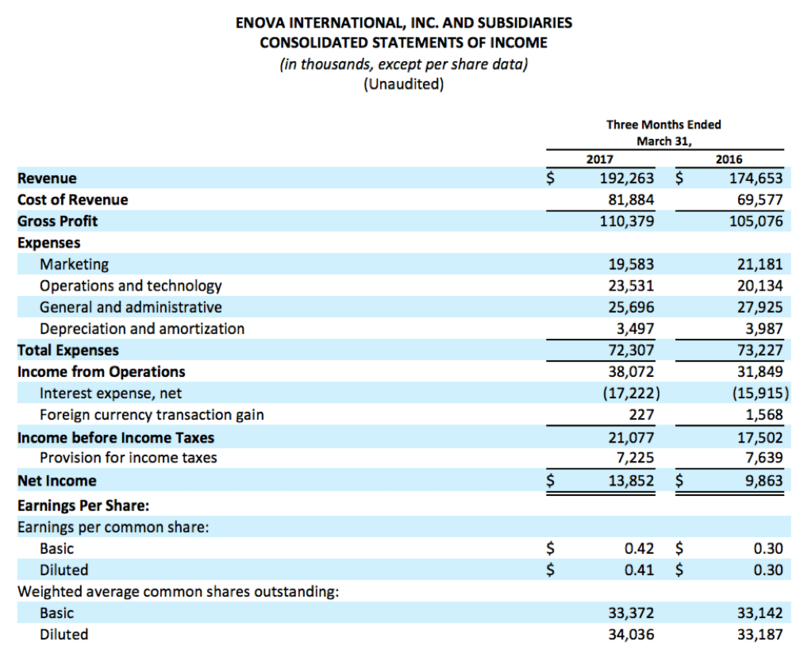 During the first quarter, Enova generated $119.9 million of cash flow from operations. 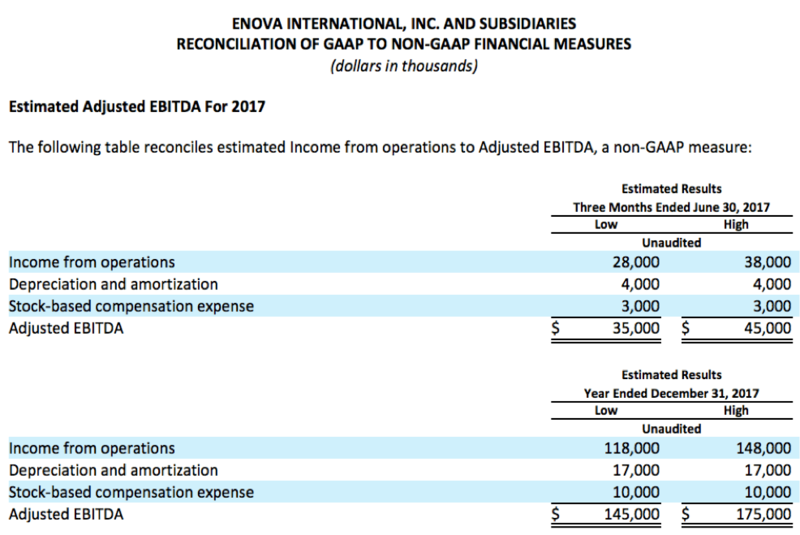 For the second quarter of 2017, Enova expects total revenue of $190 million to $200 million, diluted earnings per share of $0.20 to $0.40, and Adjusted EBITDA of $35 million to $45 million. 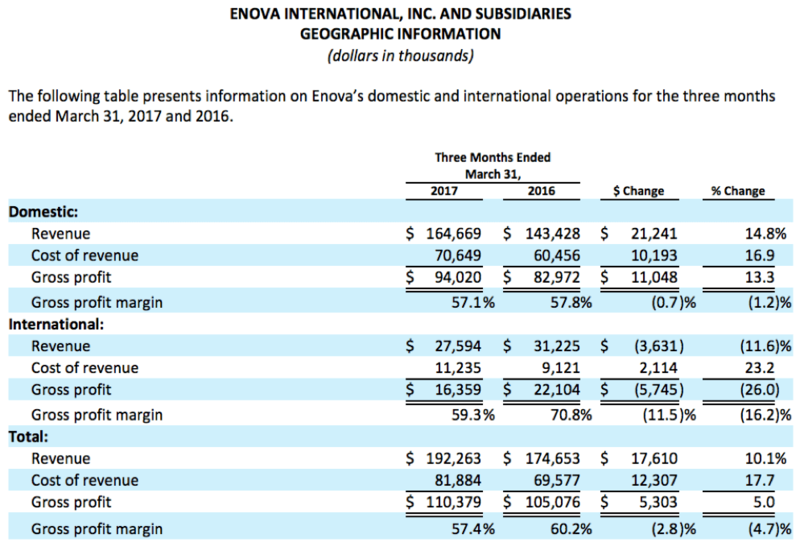 For the full year 2017, Enova expects total revenue of $810 million to $880 million, diluted earnings per share of $0.88 to $1.44, and Adjusted EBITDA of $145 million to $175 million. Enova will host a conference call to discuss its results at 4 p.m. Central Time / 5 p.m. Eastern Time today, Thursday, April 27th. The live webcast of the call can be accessed at the Enova Investor Relations website at http://ir.enova.com, along with the company’s earnings press release and supplemental financial information. The U.S. dial-in for the call is 1-855-560-2575 (1-412-542-4161 for non-U.S. callers). Please ask to be joined to the Enova International call. A replay of the conference call will be available until May 11, 2017, at 10:59 p.m. Central Time / 11:59 p.m. Eastern Time, while an archived version of the webcast will be available on the Enova Investor Relations website for 90 days. The U.S. dial-in for the conference call replay is 1-877-344-7529 (1-412-317-0088). The replay access code is 1010-5535.